I was about two years younger than most of my classmates through junior high and high school. It was a terrible ordeal. While I thought I was mentally and psychologically on par with everyone, I knew for a fact that physically, I was way, way behind. The gawky teenage years were magnified and multiplied, tragically, for me. I had braces and breakouts well into my junior and senior years, and most dooming of all – I was completely flat chested. I had no hope of ever catching up. High school is far behind and though I remain somewhat impaired in the aforementioned area, I have moved past it. Or so I thought. Many, many years ago, my parents would pick me up from school and take me to a lovely restaurant with an even lovelier view of a lake. Dressed in the dark green plaid jumper that was my uniform, I marched in behind mom and dad as the maître d’ gushed over us all and led us gracefully to what dad had at some point decided was the best table. This was a fancy restaurant with white tablecloths, ice sculptures of swans, waiters whose shoes shone and smiles sparkled as they poured bubbly water and the fruitiest fruit conga I have ever sipped. A bread basket worthy of kings and queens would carried out moments after my chair had been pushed up to the table and my mouth would water as I gazed at minuature baguettes, flaky croissants, hearty rolls of nut-studded wheat, and long, crunchy grissini. After making a careful and difficult selection, beautiful pale butter ridged like the most perfect seashell would be delicately placed on my plate. 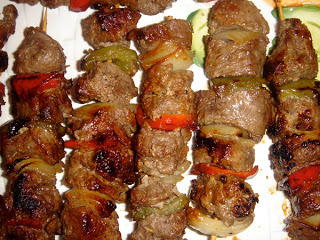 Lunch was usually filet mignon with béarnaise, which I would spoon on without any qualms…all this luxury, just for me. The filet was always accompanied by pommes soufflé, and there was nothing like those golden, crispy pillows of fried potato. I knew I was a lucky girl to be allowed to eat this way. But, the best was yet to come. Enter The Dessert Cart. Aside from the deboned chicken that I’ve written about time and time again, The Dessert Cart is for me the ne plus ultra. There is absolutely nothing that compares to it. I dream of owning a dessert cart (and a wet bar, but we’ll talk about that later) and loading it up with chic sweetings. The Dessert Cart at this particular restaurant was all wonder and delight: floating islands, baked Alaska, dense chocolate cake, goblets of ripe red berries, sauce boats, and my favorite, profiteroles. Three perfect puffs would present themselves, lightly golden and starting to ooze out ice cream filling, and then, the waiter would pour the hot chocolate sauce over them, coating them slowly and seductively. 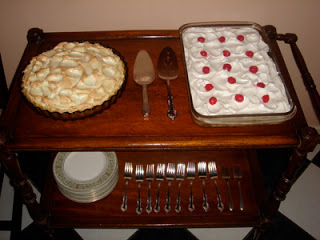 My Mister’s grandmother’s dessert cart. There are certain fruits back home that are not easy to come by in the US, even in the southernmost extremes of its geography. Some, such as nancite, a cranberry-sized fruit of bright yellow skin and white interior with a gaping belly button that exudes a heady and nauseating stench, I am happy to be safely away from, but others like sapote and níspero I crave. 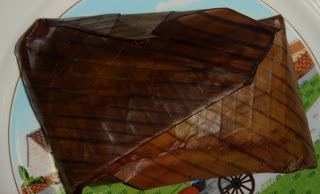 Sapote is rather like an avocado in shape and flesh texture. The exterior of the footballesque fruit is brown an rough, but the inside is buttery, smooth, and rich terracotta orange in color. A glossy black seed is tightly wedged into the velvety flesh. 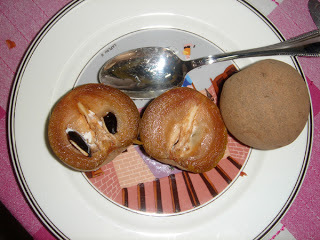 Sapote is for the persevering only, as it will frequently be filled with wriggling white maggots or be ripe to the point of fizzy fermentation. Should you chance on a perfect one, though, you will be rewarded. 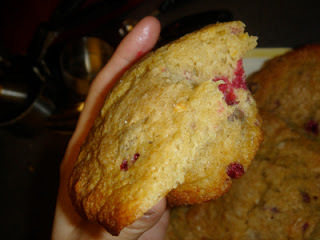 Decadent, it coats the palate and tongue with buttercream texture and aromas of exotic dark chocolate and mellow spices. 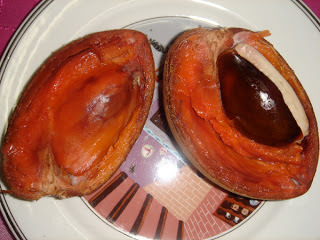 Níspero skin is also dull brown and coarse, and while its interior is not as rich and smooth as sapote, it does share with it unusual flavors. Níspero is grainy and fibrous, like a cat’s tongue. Redolent of chocolate and moss, it smells of earth dampened by rain, moistened cedar, and secret hiding places. 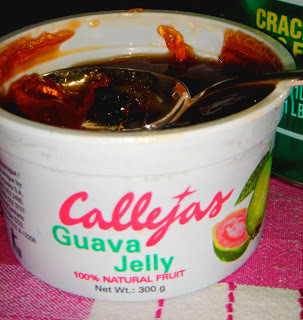 Other fruits, like guayaba and jocote were not yet in season, and so I was able only to have the former in jelly form and the latter in preserved from. Many of you are probably familiar with guava paste or guava and cream cheese pastries as the flavor combination is rather popular. 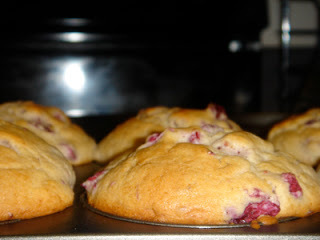 I never tire of the taste, perhaps because like Proust’s madeleine, it reminds me of childhood. My mother and I used to have “tea time,” whose fare always consisted of toast spread with butter and jalea de guayaba and topped with a slice of cheese. Jocotes bring to mind olives with great big pits. During semana santa (Holy Week) they are available everywhere, their bare-branched mother trees decorated with clusters of the sour green fruits. My grandfather has a farm in Granada and during semana santa huge basketfuls of mangoes and jocotes would be brought from there and lined up down the corridor. I would eat one after the other, wincing as the too sour ones wore down the enamel on my teeth and sucking greedily on the ripe red ones that were a prize to find buried in the multitude. 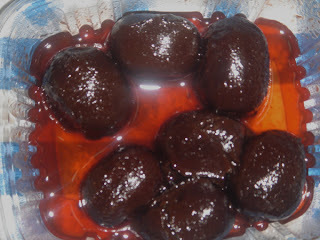 Jocotes en miel are the preserved variation and it is all I could get in early February. If March jocotes recall the hot months, these honeyed bites are bits of waning summer. I succeeded in my plan to have a healthy breakfast and ignore BK and McDonald’s. Ignoring BK was east, as there is no outpost at EWR. McD’s was a a feat: you can access it via two counters, one in the main corridor and the second within the actual food court. Also, there is a 12-foot Ronald over the counter windows, smiling his big red smile, arms wide open in welcome, fingers spread out, beckoning! Am quite certain there are subliminal messages calling out to innocent passersby… “Coooooome to meeeee….” Struggling with my inner Greedy Smurf I marched resolutely to my gate. By 10:00am my stomach was grumbling and I had a bagel, but I thought it was a much better choice than a hashbrown patty. I was expecting to taste public school cafeteria, but it was, shockingly, a slight improvement on that childhood nightmare. The best part was the wrapper. 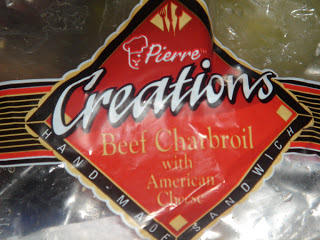 This uniquely American creation (its being microwavable was just the icing on the cake) was manufactured by a company whose logo is a little, mustachioed chef by the ultra-French name of Pierre! Aside from telling you that I am – or was, until very recently – a culinary student I have told you very little about myself. 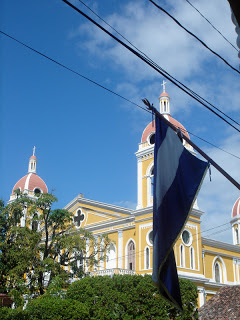 Here’s a biographical tidbit: I am from Nicaragua, and more specifially, the small colonial city of Granada, “La Gran Sultana”. I grew up here and there, and have lived in the U.S. for the past ten years, but roots remain planted at approximately 12° 10′ N 86° 15′ W.
One of the things I hope to do someday is a thorough research project on the food of my country: why do we eat what we eat? What is really native to us? Who taught us to cook? So many questions about what we consume and why that I would like to answer. I visited last week, and although ten days is but a brief sojourn, I tried to eat as much as possible. Most of the time my stomach was filled to capacity, but in the interest of scientific investigation, I chewed bravely on. This is merely a brief overview of my native cuisine, but I hope to add more information, as well as recipes, in the not too distant future. 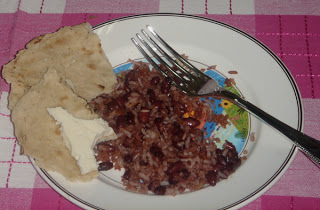 Rice and small red kidney beans are on the menu three times a day. For breakfast, they are mixed and fried together to make gallopinto (literal translation spotted or painted rooster, alluding most likely to the reddish tint that roosters have which resembles the final product). Gallopinto is often accompanied by eggs, either revueltos (scrambled) or as they say in my grandmother’s house, perdidos (lost) or fried, as well as by tortillas or bread. 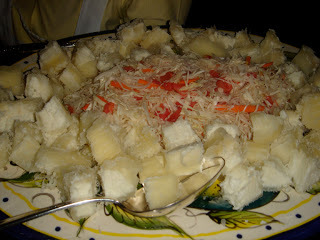 You could also go the full monty and have fried plantains or maduros (sweet, ripe plantains) and cheese, either fresh or fried. 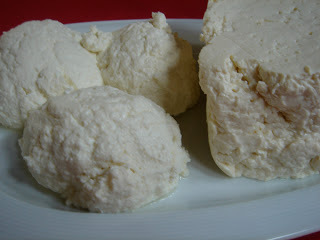 Cuajada and queso fresco, two traditional fresh milk cheeses. 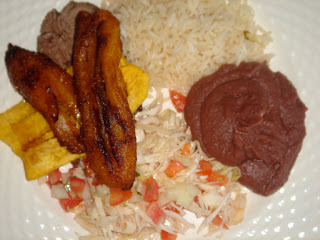 At lunch and dinner, the rice and beans will be presented separately at the table, but there they always are. Growing up, meals served at home were of an international variety, but regardless of what we were having, rice and beans would be at the table. 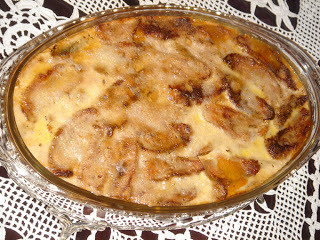 My mother and I always fought against two starches on the same plate, for example, if we were having lasagna there was no way we were going to have R&B there as well, but my younger brothers waved all propriety aside and would have them at the end of the meal, as “dessert”, they’d exclaim. 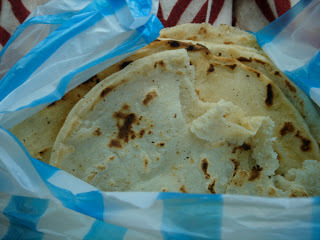 Corn products are as many can guess, a staple, tortillas being the most evident example. Most people buy theirs from vendors selling from humble roadside shacks. At under $1.00 for 10 tortillas, they are one of the more affordable food items available in a country that is among the poorest in the world. 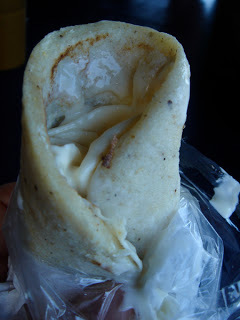 A tasty local treat is quesillo: Quesillo is string cheese that bears a striking resemblance to mozzarella. A braid of it is wrapped in a tortilla, smothered with sour cream (our version being much more liquid than the US variety) and a slaw of pickled onions. The taco-like roll is placed in a slender plastic bag, and voilà, you’re ready to eat. 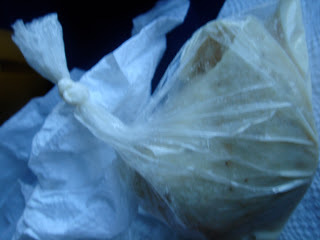 The best part of the plastic bag is that you can tie it, cut off the bottom end, and finish eating your quesillo from that side, the better to enjoy the sour cream and pickled onions that have pooled at the bottom. Corn is also the basis for a number of tamales: tamal pizque, of a greyish green hue that comes from the ash that’s incorporated with the corn; the sweeter and more tender yoltamal (which I unfortunateley couldn’t get while in Nicaragua); and nacatamal, the mothere of all tamales: weighing in at at least two pounds, this huge tamal cotains corn masa, pork, potatoes, rice, tomatoes, prunes, and raisins. It is a delicious and incredibly filling meal. 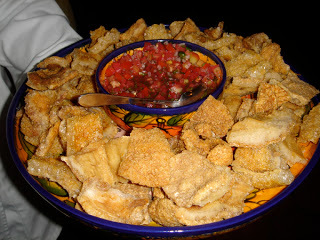 The mister’s grandmother treated us to one of my favorite things; chicharrón con yuca. Pork cracklings are paired with steamed yuca and topped with a slaw of cabbage, tomatoes, white vinegar, and tiny, spicy congo chiles, which are the only chilies we use and never in great quantities. 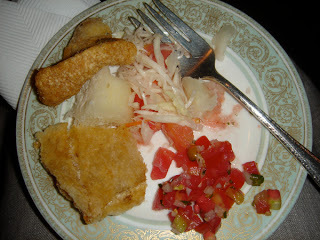 If bought at a stand at the market or a park, chicharrón con yuca will be served on a chagüite, or plantain tree, leaf. We were also treated to fried plantain chips, grilled meat kabobs, and my favorite, maduros en gloria (sweet plantains in glory, literally, but figuratively meaning that they’ve died and have gone to heaven): the sweet plantains are fried, then smothered with cream and cheese and baked for a bit in the oven. Really, you must try it. 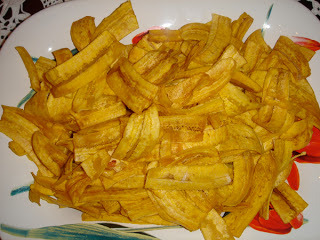 You can find the sweet plantains at your local market (*do NOT buy green ones and expect them to ripen. Buy the yellow ones and wait for them to ripen further, until the skins are black as this will ensure they are tender, rich, and perfectly sweet). 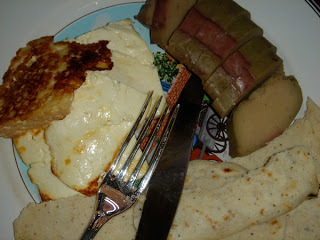 There is a recipe from a traditional Nicaraguan cookbook, 50 años en la cocina, by Angélica de Vivas, that I will try at home with American ingredients and post on the site as soon as I can.